Guide's day off trips don't happen as often as I would like. Of course, helping others catch fish is always pretty awesome some I'm not complaining. 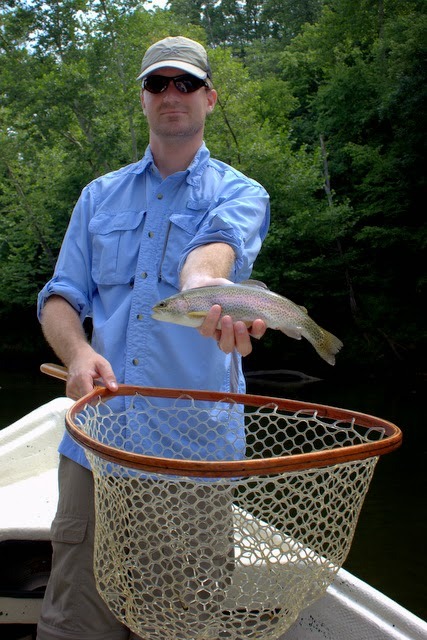 I guess you could say that I'm simply pointing out that being the one handling the fly rod is nice on occasion. Last week I had a short vacation. My cousin Nathan came up to fish with me for a few days. 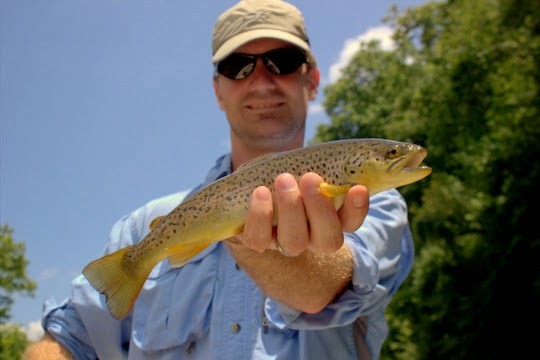 We started the week fishing for smallmouth, followed that up with a trout float on the Caney, and finished up with some awesome trout fishing over in the Smokies on a day that was all about sheer numbers. In other words, I had an incredible week. 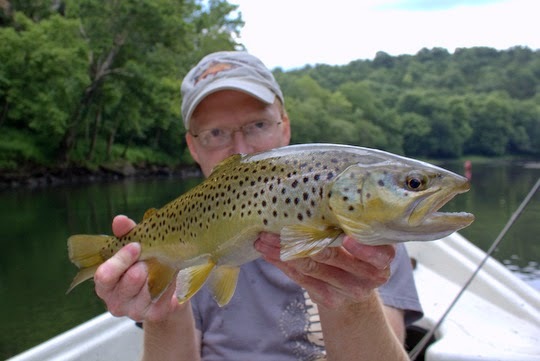 The smallmouth trip was a lot of fun, but neither of us hauled a camera along so there is no photo evidence. I guess that means I can inflate the size of the fish we caught. 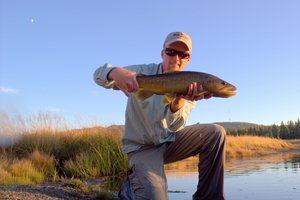 Really it was a standard smallmouth wade trip with some nice fish caught but nothing to write home about, the kind of comfortable every day fishing that scratches the itch but leaves you wanting a little more. Day two started out much the same with the main difference being that we were floating in the drifter instead of wading. The generation schedule on the Caney has been a little strange lately. The Corps of Engineers can't seem to decide what schedule is the best so each float is determined the evening before after a consultation of the following day's generation schedule. We figured that we could sleep in a little and still make it in plenty of time to catch falling water. We dumped the boat and were into fish before I had really gone anywhere. There's nothing like those willing hatchery fish waiting at the ramp to get the skunk off so everyone in the boat can relax and focus on the task at hand. I was at the oars and Nathan was wearing out the fish. 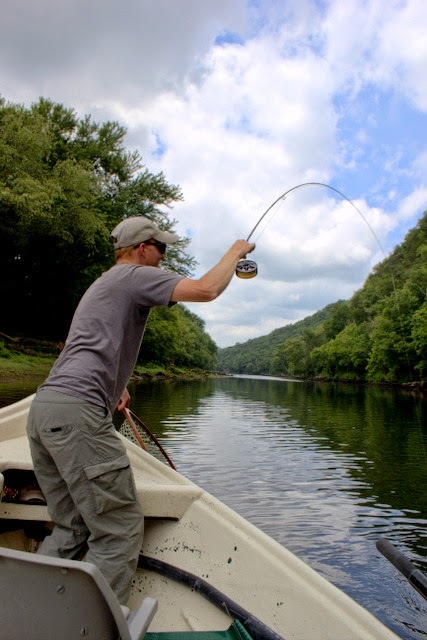 By the time we got around the first corner, I had turned the boat sidewise in the soft current so we could both fish. Rowing and fishing at the same time presents a minor challenge but nothing that cannot be overcome. It wasn't too long before I had caught a couple as well and decided to just focus on rowing while Nathan fished. 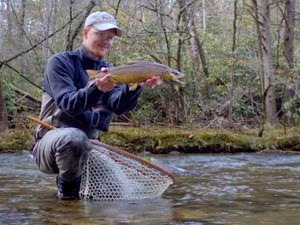 He quickly got several nice brook trout as well as a few rainbows but the nice browns were eluding him. Eventually he offered to take a turn rowing and I assured him that he could take over at a certain point. I was hoping he would catch a nice fish first but eventually we got to a spot I was dying to fish, and I let him take over rowing duties. 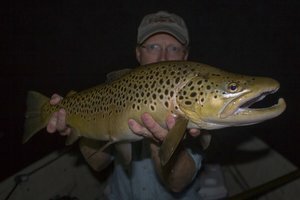 Sure enough, two casts later (seriously, I had barely even got to the front of the boat) something big came up and inhaled the hopper I was trying out. Fighting the fish on one hand and telling Nathan where to row on the other kept me busy but soon the fish was in the net and we could all relax. 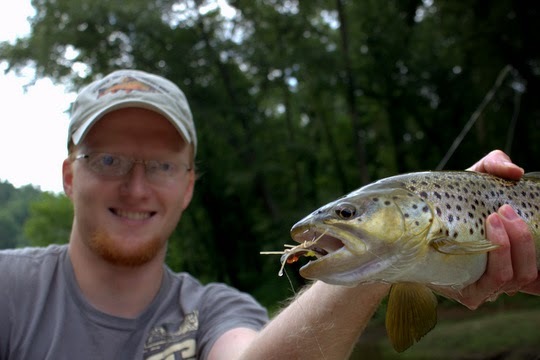 Nathan took over camera duty while I enjoyed the nice brown trout. 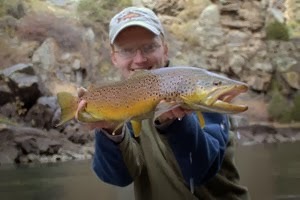 Soon we took off again, and I continued to catch fish on the dropper under the hopper. 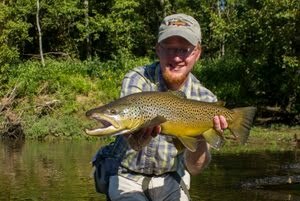 Nathan eventually figured out how to row and fish as well and started catching some nice fish including his brown for the slam. Not too long after that we made it to the take out just as the rising water caught up with us. I was glad that we had finished before the water came up too much. Nathan was getting pretty tired by the end. The river can get awfully hot without any shade and a hot summer sun beating down. We were soon on our way back home to get ready for the Smokies adventure starting the next morning! David, you're a good guy but you really have to stop making me jealous. 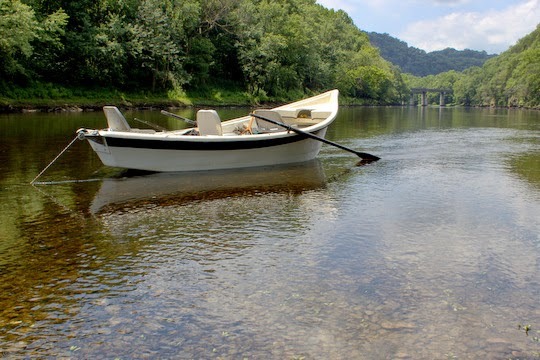 I would love to fish from a drift boat once. 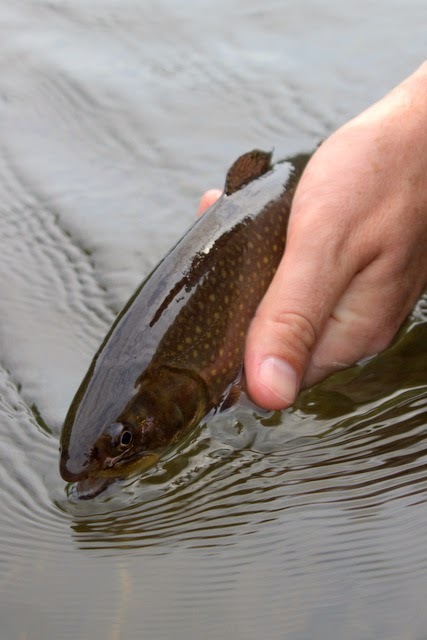 Especially when you're on water that produces so many nice fish. Have fun my friend. Bill, I'm looking forward to the trip!